We went to the local cheap shop to buy, of all things, Isopropyl Alcohol which we use for cleaning laptops, phones and tablets. As this is a cleaning item it is not on my Can’t Buy list. ;) Last time I’d paid some ridiculous amount for it at Bunnings for what seemed like a tiny bottle of it – here we got double the size for half the price. While there I spotted these colourful hanging things for $12.99 and the pompoms were velvety and so gorgeous, but KTHXNOBUY. You guys, YOU GUYS. Socks are like my kryptonite. I am a firm believer that you can never have too many socks and this one time I bought a truly magnificent set from Aldi, when I went back the next week to get more they were totally sold out. Aldi socks are perfection in my opinion especially the workout socks. They have never once let me down yet, not a single blister ever, and they are my main go-to for a workout sock. PLUS you get three pairs so they are $2 a pair which is CRAY CRAY. This did lead me to do a big clean out of the sock drawer which provided me with an extremely shocking discovery, I will tell you about that on Wednesday. In the process I re-discovered a few old favourites that had vanished. I do have enough socks to last the year. I really do. But not buying these socks was one of the harder moments of this challenge for me. PS Sorry if I am absent a little bit last week and this week, The Other Half is on holidays and we are catching up on some chores and activities we have been meaning to do. :) There are several emails I have not replied to and I am not leaving a lot of comments. I’ll get to it soon, I promise! 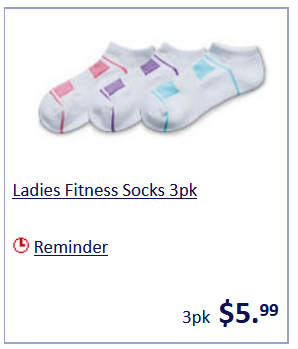 Need to get in on the Aldi sock action myself. Enjoy your break with the other half. I like all the things you pictured – you showed admirable restraint!